Take home your very own Sherlock Holmes! Take home your very own Sherlock Holmes! "Let's see, Watson... I'm wearing my deerstalker hat and Inverness cape. I have my pipe and trusty magnifying glass. I look the same, but everything is significantly smaller. In fact, I estimate that I'm approximately 11 inches tall. Good lord, Watson. I've got it... I've been turned into a doll!" As usual, Sherlock Holmes is correct. He's now a doll and has never been cuter. 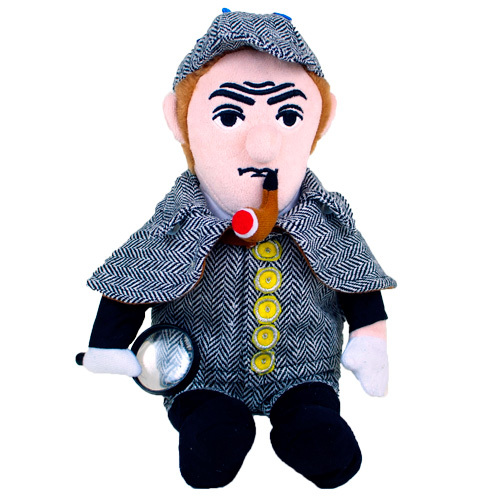 Everything on our Sherlock Holmes Little Thinker Doll is meticulously crafted, from his trench coat and cape right down to his magnifying glass, which actually works! So should you purchase one? "It's elementary, my dear Watson." "Let's see, Watson... I'm wearing my deerstalker hat and Inverness cape. I have my pipe and trusty magnifying glass. I look the same, but everything is significantly smaller. In fact, I estimate that I'm approximately 11 inches tall. Good lord, Watson. I've got it... I've been turned into a doll!" As usual, Sherlock Holmes is correct. He's now a doll and has never been cuter. Everything on our Sherlock Holmes Little Thinker Doll is meticulously crafted, from his trench coat and cape right down to his magnifying glass, which actually works! So should you purchase one? "It's elementary, my dear Watson."